Could the earth be overtaken by invaders from Mars? On October 30, 1938 a lot of people thought so when the Mercury Theatre on the Air presented a radio adaptation of H.G. Wells’ novel The War of the Worlds. The broadcast took the form of a series of radio news reports, many on location as the invasion was supposedly taking place. Even with the disclaimer at the beginning of the broadcast that what followed was a fictional story, widespread panic ensued, in part because many listeners didn’t tune in at the top of the hour and missed the announcement. They were late because they had been listening to the Charlie McCarthy Show on a rival network, but that was in 1938. 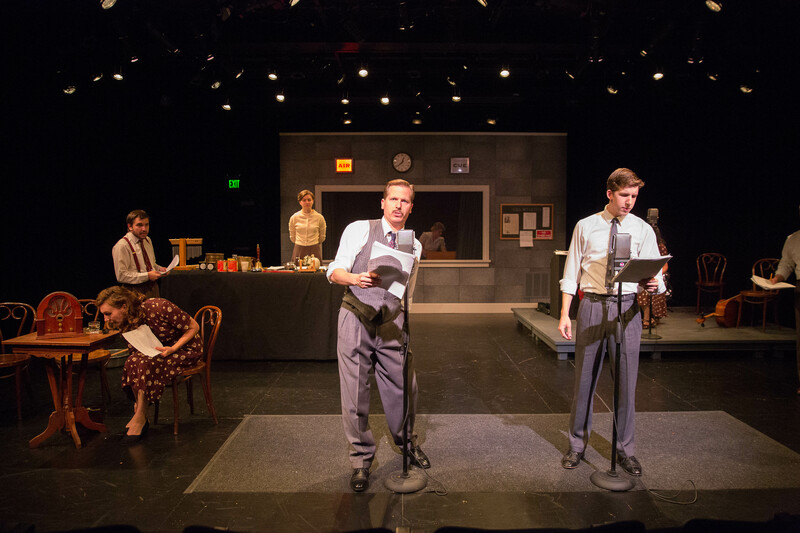 In the summer of 2014, Stanford Repertory Theater continues its Orson Welles festival with a must-see, fully staged version of this famous radio play. The original broadcast was 62 minutes on the Columbia Broadcasting System and was intended as a suitably scary Halloween program. There were some changes from the original Wells novel, primarily the location. H.G. Wells set his story in England. The radio broadcast moved the action to Grover’s Mill, New Jersey and New York. Also, the radio broadcast compressed the action into its hour long timeslot. True to form, Stanford Rep’s presentation keeps the action to one hour with just a few additional tweaks. The stage version begins by taking the audience inside the radio studio as the audio actors are readying themselves to present this epic tale. Anne Dauber’s set design isn’t elaborate, but it certainly gives the audience the feel of the studio. Two standing mics along with several others at various tables and areas of the studio allow for some distributed action. There are several regions about the stage. Upstage center, the radio station sound booth is walled off behind a window scrim. There is an area upstage left where the musical interludes are performed, and downstage right and left, there are tables where the radio personalities perch at times. The downstage right table doubles to provide a snapshot into somebody’s home as a listener sits glued to her radio toward the beginning of the show. As a nice touch prior to curtain, a recording of the Charlie McCarthy Show plays over the sound system. A Foley table is prominently displayed upstage right. A preshow announcement suggests that audience members close their eyes to allow themselves to more fully imagine the story being described, but it’s interesting to watch the various apparatus used for the myriad sounds within the story. Director Rush Rehm worked with sound designer and Foley artist Brigitte Wittmer to nicely embellish the sound effects making them play better to a modern, live audience. Wittmer is ever active during the performance, but she has plenty of help from the entire cast at one time or another as they make their way to her corner of the stage to help with things such as picking up a tin can to create an echo chamber effect, or bringing a bucket of water and a plunger to the forefront to provide harbor noises. Rehm had a little help from Larry Maslon who wrote a prolog for the piece. This allows the company to set the scene a bit more than jumping straight into the radio broadcast would. Rehm also modified the end of the story to give it more zip. The later portion of the 1938 broadcast wouldn’t translate as well to the stage, so he modified it to help give the theatre audience more of the feeling that those listening to the original radio broadcast must have experienced. Rehm also has the actors add some movement to make the presentation visually stimulating, recognizing that even though they are depicting a radio show, they are playing to a live theatre audience in 2014, and that audience wants some action. Happily, the audience isn’t disappointed. While most of the action depicts what one might imagine would be happening inside the radio studio during a live program, some movement seems a little contrived. One seemingly extraneous sequence involves several cast members walking in circles behind the Foley table murmuring to create a crowd effect when they could just stand still making the same noises including altering their volume levels to simulate that milling crowd. Examining that movement more closely, it both adds a bit of tension to the scene while hinting at a tinge of radio set comedy. The cast includes David Arrow, Dante Belletti, Noemi Ola Berkowitz, Monica Cappuccini, Don Demico, Thomas Freeland, Sarah Gage, Weston Gaylord, Elizabeth Knarr, Courtney Walsh, and Brigitte Wittmer. This mixed cast of professionals and students work very well together, and each actor plays numerous parts. The cast members are particularly good at altering their voices for the different characters that crop up in the story while maintaining their demeanor as their primary persona throughout. They come across as the “talent” in a radio studio, versed in the wide variety of assignments they might receive. In this whirlwind story, the dramatic cutouts from the “location broadcast” are extremely effective and very well timed. These sudden cuts are followed with seamless character changes. There are even musicians in the group as the story within the story jumps locations including visits to the “regularly scheduled” musical interludes in the Meridian Room in the Hotel Park Plaza. In this case, that includes four vocalists who double on other instruments including violin, cello, electric guitar, and piano at one time or another. The musical quality isn’t quite concert level and the vocals are a bit unbalanced, but it fits as this production is done as a 1938 period piece. Though we know more about the planet Mars now than we did in 1938, the story still works well as it was originally intended. This production won’t cause mass panic, but it will provide a very lively hour of entertainment that will stick with you and allow you to appreciate H.G. Wells’ story even more. And if you see any thick black smoke emanating from a field in the distance, just call the fire department from your cell phone, make haste in the opposite direction, and above all, don’t panic. Info: See repertorytheater.stanford.edu or call 650-725-5838.